Future-ish: Cocktail Astronomy | Cheers Proxima b! Cocktail Astronomy | Cheers Proxima b! This week we would like to toast one of our nearest exoplanet neighbors, Proxima b. That's right, in 2016 scientists confirmed the discovery of Proxima b, an Earth-like planet in the Alpha Centauri system. Alpha Centauri, long thought to be one star but actually a trio of stars including the binary stars Alpha Centauri A and Alpha Centauri B, as well as a third red dwarf star, Proxima Centauri. Though many Earth-like exoplanets have been identified, the proximity of Proxima b and the fact that it is in the habitable or 'Goldilocks' zone is what makes this discovery so exciting. 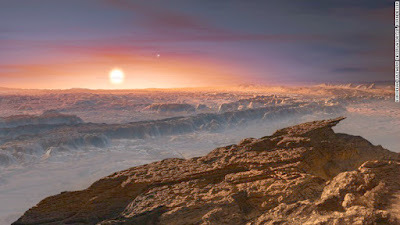 The latest word (August 2017) is that Proxima b may not be able to sustain an Earth-like atmosphere but we still have hope that we do have neighbors on Prixima b and that they are fabulous. The best news is that is Proxima b resides in the habitable zone of it's start which means liquid water could exist. If you have liquid water, then you can have, yes...ice cubes for cocktails!